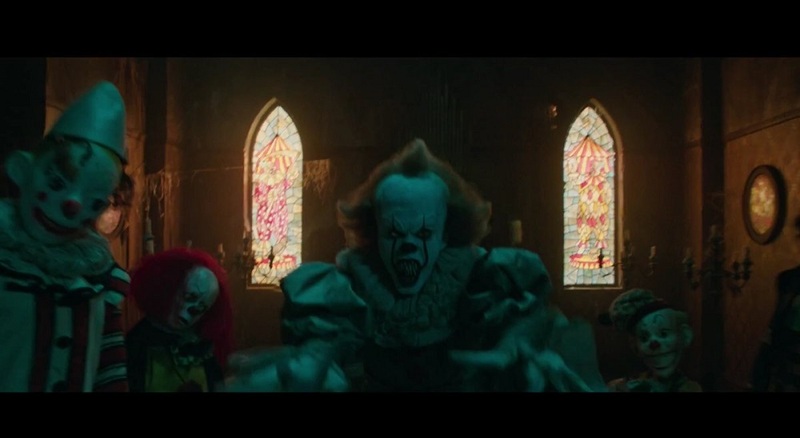 The terrifying Pennywise the Dancing Clown of Stephen King's It returns to pull children into sewers in the chilling new trailer for the upcoming adaptation of the 1986 horror novel. The clip opens with an ominous portrait of youthful innocence and adolescent anxiety in fictional Derry, Maine that builds to one of the story's most infamous moments. A young boy named George chases a paper boat down a flooded street and watches it slip into a storm drain. As he peers inside, he encounters It lurking in its preferred form, Pennywise the Dancing Clown. The It trailer goes on to tease Derry's creepy history and follows the Losers' Club as it tries uncover the secret that's been haunting the town for centuries. Pennywise (Bill Skarsgård) continues to appear out of nowhere for some casual terrorizing, flashing his ghastly yellow eyes. 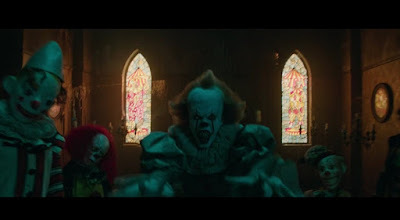 Easter Egg: Tim Curry's Pennywise can be seen to the left of the current Clown in the photo above.